The BAMSE classroom trainer (CTE23) is developed and built on commission by the military forces and has high demands on mobility, EMC (electro magnetic compatibility), environmental capability and original lookalikeness. In CTE23, MSE has developed a complete hardware solution ready for generating scenarios. CTE23 has all essential functions as the live firing unit (EldE 23) and for realism it is equipped with all facilities. All links to the system are connected via quick-release connections on the electronic enclosure. 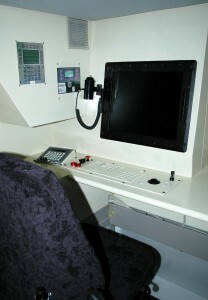 The simulator is all build by modules facilitating service and maintenance. All modules are easily exchanged. To get the simulator realistic the interior is as close to original looking as possible. Regarding mobility, the chassis is mounted upon wheels. In transportation mode the unit can pass a 900 mm narrow door frame. When in use the simulator space is expanded by the expansion roof. 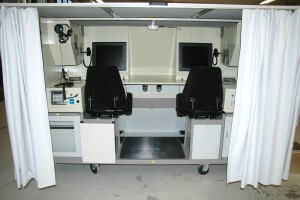 The operating units in the simulator are the same type as the live operating units. CTE23 contain three communication units, MLT (Multi Line Terminal). All of same type as in EldE 23, one each for the gunner, commander and for an exercise leader. Both gunner and commander have full scale monitors integrated in the chassis presenting all necessary information.